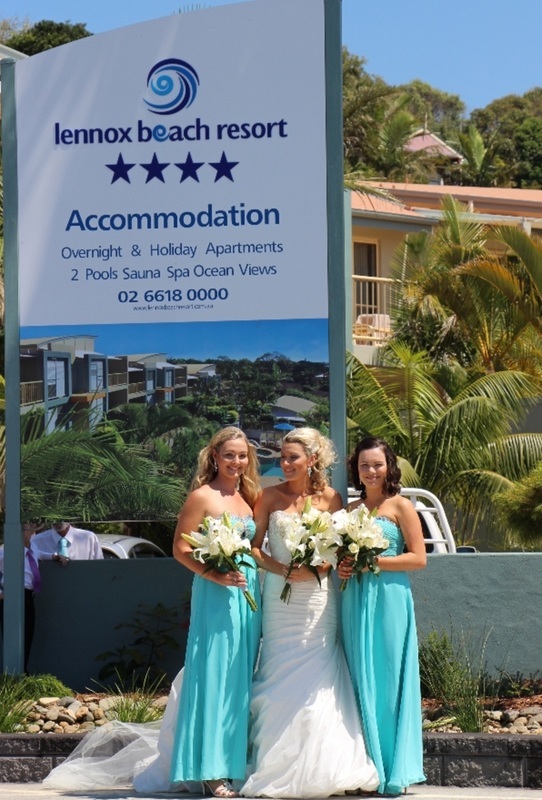 Lennox Beach Resort is the ultimate choice for accommodating your wedding guests. Combining a wide choice of quality apartment types and a fabulous ‘walk everywhere” location the resort provides the perfect atmosphere for your guests to celebrate your special occasion. We can accommodate couples in our superb Spa apartments and families in spacious 2 or 3 bedroom apartments. The facilities are ideal for group get-togethers in the idyllic swimming pool/BBQ area and there are many restaurants and street cafes within a 2 minute walk. Many wedding parties spread their celebration over a number of days and the holiday atmosphere in “laid-back” Lennox Head village sets the tone for an unforgettable wedding celebration. Tariffs are very reasonable especially outside school holidays. As the largest accommodation provider in Lennox Head, our resort can accommodate 132 people. There are many ideal “out-door” ceremony locations in and around Lennox Head and an amazing array of reception venues in the general area. We can assist with arranging bus transport if required for the movement of guests to and from the reception/ ceremony. Lennox Head is easily accessible by road and is close to Ballina/Byron airport and less than 1 Hr by road from Coolangatta airport.